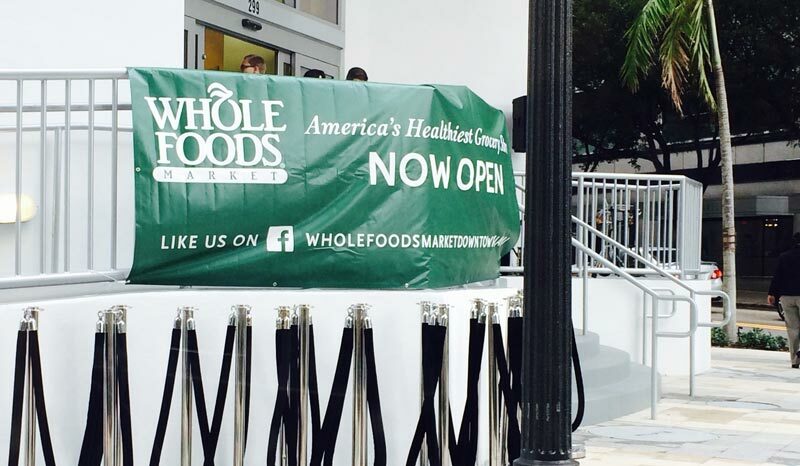 This morning at 8:00 a.m. the new Whole Foods Market opened in downtown Miami. From the crowds you would have thought that there was a rock star in town. People were lined up around the block and traffic was snarled around the corner. Despite having stores in Miami Beach and Coral Gables, this opening was a big deal. I must confess to being a bit of a Whole Foods junkie. Having spent so much of my career on the road, the first thing I would do when landing in a new city would be to check out the nearest Whole Foods so that I could pick up lunches, and maybe a couple of dinners for my stay. It became that constant beacon of health and homeyness in an otherwise diet-busting travel schedule. But I have also come to admire what they have been able to accomplish as a brand, and there are several branding and process lessons a small business, or any business owner can take away from their store opening this morning. Build Buzz: For the past two years, before the ground was broken on the high rise in which they would be the ground floor tenant, their logo has been on a banner on the site. This became a full sized “Future Home of Whole Foods” banner several months before the opening, and their formal sign graced the premises before they even began the interior build-out. They worked the media channels to announce the timing of their opening and offered gift cards to the first 500 customers, promising that one would be worth $500 (I arrived an hour after the opening and was not among the first 500. That should give you an idea of the success of that strategy!). Manage The Experience Of Your Customer’s Entrance: Whole Foods knew that their opening would be crazy, so they hired extra police officers to direct traffic, even blocking a couple of streets to smooth the flow into their garage. Friendly staff held arrows directing customers toward the parking entrance and within the garage helped point out empty parking spaces. The garage itself is brightly painted with murals and well lit. At the front door they had a band playing and staff handing out flyers and helping customers with carts and baskets. Train Your Brand Image and Reinforce What You Train: Whole Foods has their openings down to a science. I interviewed a member of their regional team of 60 staff who do nothing but travel to new locations, putting in place the Whole Foods processes and training new employees. I watched them coaching the new employees on the job, reinforcing their upbeat attitude, offering guidance, making sure that each customer experience was smooth and working with team leads on management now that they were live. The company has the same raw materials to work with as Publix, yet at each Whole Foods I have visited (dozens now), their staff are significantly friendlier and much more helpful. That kind of hospitality can only come from training and reinforcement. Staff Like Crazy and Make Sure They Aren’t All Newbies: In addition to the 60 process implementers and trainers in the region, Whole Foods adds another 40 experienced staff to the opening. They also encourage staff from other stores to move to the new store if it is more convenient. The store was insanely crowded at the opening yet it seemed to flow smoothly. There were staff available in every aisle, actively reaching out to offer their assistance to customers and welcome them to the store. Even the guy who took my cart from me in the parking lot smiled and thanked me for shopping with them. REALLY thanked me, with a smile and everything, as opposed to just going through the motions. When was the last time you had that at Publix? Focus On Your Target Customer Profiles: I’ll talk more in another entry about the importance of developing Personality Profiles for your target customers but Whole Foods clearly understands who they want as their best customers. In each store they tailor their selection of products to their market, offering local produce and locally made goods, and understanding the food preferences of the cultures in their neighborhood. This particular store is in the middle of downtown condos and businesses. As such they decided on more compact shopping carts (with a handy opening to hold your lunch time smoothie so it won’t spill), and a much wider selection of pre-made meal items than I have seen at their other stores. Knowing they serve a large Brazilian population in the area for example they offer Brazilian rice and beans with a sign in Portuguese (feijao com arroz). In fact there are many Latin dishes from a variety of regions and the hot/cold buffet area is quite extensive. They also know that they will have shoppers coming in for a coffee, and others coming in to buy groceries. Were they to offer free parking, it would be likely that people would take advantage of that and avoid the typical $20/hour rates in downtown Miami. So what did they do? They offered graduated discounts on parking such that their high value customers who are parking to buy groceries will be able to find spots. The more you buy, the more likely you are to have free parking for your visit. But if you just pop in for a coffee and are out in 30 minutes, that’s free too. Make The Store Look Ready: A Whole Foods store carries approximately 20,000 SKUs and each of these items was fully stocked and faced, presenting that wonderful neat and full appearance so important in retail high inventory stores. The team leads in each department were actively monitoring what was selling and ordering replenishment stock from the back. If they didn’t have a produce item for example, they let customers know when they would arrive. The goal of course is that when a customer enters your store they should find what they are looking for or receive excellent service that entices them to return when it will be available. Partner Creatively With Your Suppliers: At every Whole Foods store opening, the Wisconsin Cheese board gives a cheese sculpture as a gift. It is a nice gesture that adds novelty to the opening. Other suppliers were in the store offering free samples and providing advice on the products. What could you do to work creatively with your suppliers and offer a novel experience for your customers? Reward Your First Customers With Surprise Specials and Freebies: Whole Foods is generally pretty good about offering tasty samples, but for their opening they were barbecuing chicken, frying bacon (nitrite free of course! ), serving cheese, offering good sized portions of crackers and dip, providing fruits, veggies, sliced up baked goods and samples of their sandwiches. I could have had a full breakfast there! And if that wasn’t enough there were really good specials on a lot of the items I buy regularly. What a nice surprise. Plan For Your Customer’s Convenience: Did you buy more than you thought you would? No worries, they had handy Whole Foods branded wheelie carts for you to take your groceries home, and on the way advertise to your neighbors where you were. Need a more comfortable bag to carry your purchases? No problem, they had those too. Plan For A Smooth Exit: As I was checking out, a clerk went to validate my parking ticket, the cashier made sure that I was able to find everything I was looking for and both the cashier and bagging clerk commented positively on some of my purchases that they had tried personally, even offering suggestions on what I might try next time. The checkout was fast and efficient and I was out of the store and off to my first meeting right on time. These 10 key lessons to a successful store opening can be applied to most small business, either as part of a grand opening or just as good ongoing practices. Your new downtown Miami store is beautiful Whole Foods. Well done! I know that your stock has taken a bit of a beating lately due to increased competition in the organic grocery segment but this store has every indication of being a winner.